Friday is your last opportunity to tell the City what you think of its new bike-trail plans. For cyclists in Toronto, the future is a mixed bag. 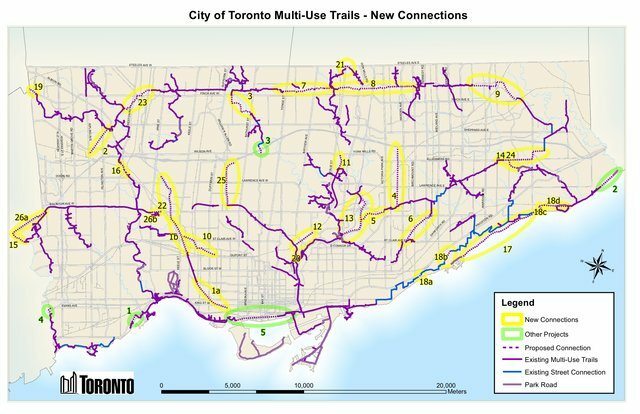 With the impending unveiling of the City’s new Multi-Use Trails Plan in March, Toronto could start accumulating new off-road bike paths at an unprecedented rate. But cycling advocates are worried that it won’t be enough to deliver an effective bike-lane network. Right now is the last window of opportunity for public input. There aren’t going to be any more public consultation meetings on the plan, but the City is still accepting feedback on the whole thing by email (reach them at [email protected]) before they finalize their findings. The deadline for submissions is this Friday, February 24. The proposal is expected to go to the Public Works and Infrastructure Committee for approval on March 21, after which it will still need final clearance from council. Andrea Garcia, director of advocacy and operations for the Toronto Cyclists Union, believes this is an exciting development that could see some important changes to the City’s infrastructure, but wonders how effective it will be at solving the existing network’s problems. This updated map shows some of the key trails and on-street connections the City is exploring. Photo from the City of Toronto. Garcia believes that the new trails, rather than serving only recreational riders, should allow cyclists who live in the suburbs to commute to work, run errands, or get around. For this reason she says it is important that off-road trails be functional at all times, no matter the time or the season. This would require plowing in winter, and lighting at night. Another concern of Garcia’s is that the emphasis in bike infrastructure planning under Mayor Ford is on putting trails where they won’t impede auto traffic. This, she said, can tie City staff’s hands, making it impossible for them to address the ongoing need for on-street infrastructure to promote safety for cyclists. Tammy Thorne, editor-in-chief of Dandyhorse magazine, is skeptical of the plan and shares Garcia’s concerns about maintenance. Thorne thinks the biggest problem is that the City lacks the political will to make better bike infrastructure. She points to Ford’s open disdain for cyclists as evidence that the City’s commitment to building new bike infrastructure isn’t as strong as it could be. “If [Mayor Ford] is not interested in bike lanes and wants people off-road we need more work to create decent infrastructure,” she added. Jennifer Hyland, a transportation planner for cycling infrastructure and planning at the City, explains that there has been some progress in connecting paths. Waterfront Toronto and the Toronto Region Conservation Authority, she said, are beginning work on filling in the gaps in the Martin Goodman Trail this year. Other work will include a boulevard trail along Queens Quay, between Bathurst and Bay streets. These projects are expected to get underway in 2013. Hyland also pointed out that the West Toronto Railpath will undergo a feasibility study this year to examine a future extension north and south. In the meantime, cycling staff are investigating a better transition from the trail to the street network at Sterling Avenue. Thorne and others are still not impressed with the progress being made on cycling infrastructure. CORRECTION: February 22, 2011, 12:50 P.M. 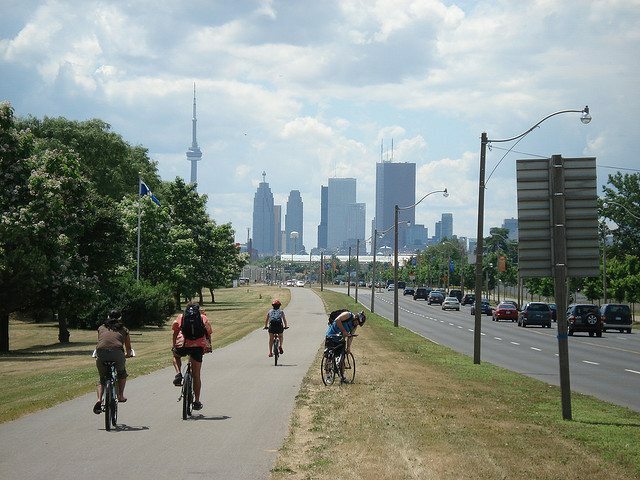 This post originally misstated details of the City’s plans for a boulevard trail on Queens Quay, omitted mention of Toronto Region Conservation Authority’s involvement in filling in gaps in the Martin Goodman Trail, and stated that those projects would be completed in 2013, when in fact 2013 is the year they are expected to commence. It also misstated Jennifer Hyland’s title and provided a link to an outdated version of the City’s trails plan. All of these errors have been corrected. CORRECTION: February 22, 2011, 5:00 P.M. This post originally conflated the current proposed bike path expansions with an earlier round of expansions whose construction is now mostly complete. The text has been amended.